Cholelithiasis is the medical name for hard deposits (gallstones) that may form in the gallbladder. Cholelithiasis is common in the United States population. Six percent of adult men and 10% of adult women are affected. The cause of cholelithiasis is not completely understood, but it is thought to have multiple factors. The gallbladder stores bile and releases it into the small intestine when it is needed for digestion. Gallstones can develop if the bile contains too much cholesterol or too much bilirubin (one of the components of bile), or if the gallbladder is dysfunctional and cannot release the bile. Different types of gallstones form in cholelithiasis. The most common type, called a cholesterol stone, results from the presence of too much cholesterol in the bile. Another type of stone, called a pigment stone, is formed from excess bilirubin, a waste product created by the breakdown of the red blood cells in the liver. The size and number of gallstones varies in cholelithiasis; the gallbladder can form many small stones or one large stone. Cholelithiasis may cause irritation and inflammation of the gallbladder (cholecystitis) that can result in a number of symptoms. The symptoms can vary in intensity among individuals. - Yellowing of the skin and whites of the eyes (jaundice). In most cases, cholelithiasis is caused by excessive amounts of cholesterol in the bile that is stored in the gallbladder. The cholesterol hardens to form stone-like substances. Increased body weight and older age are associated with increased levels of cholesterol in the bile. Thus, gallstones are more likely to occur in women, in people who are obese, and in older individuals. Some gallstones develop because the bile contains too much bilirubin, a waste product of the liver that is a component of bile. 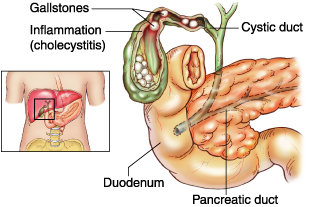 Gallstones that develop from excess bilirubin are called pigment stones.